Already covered, but here is a great example of how to deflect a discussion in one swift gesture by rephrasing it, rhetorically, as a question entirely of tone and emotion. #02: Only one notch above blatantly reducing the argument to the person (argumentum ad hominem, dealt with in the first installment of the series) is reducing the argument to its tone. This works by way of taking an indefinite break from the actual argument, and saying: you might be right, but your tone is so problematic that we cannot move on until we have sorted out the question your tone. – You’re Taking Things Too Personally. The only way to deal with the argument of tone is to doggedly focus on the argument, and resist all bait. However, what usually happens is that the attacked speaker responds to the argument of tone by something like ‘what about YOUR tone, dude?’, to which the response is ‘WHOA WHOA WHOA!’, and the argument might then spend a hundred years arguing about who is the worst offender of tone, completely forgetting the original subject of the discussion. Full article: Andrew Bolt: Shame on the witchhunters, May 29, 2013. The most interesting thing, however, is the way this argument continues in the comments of SMH, where an entire sub-argument develops over the ‘proper tonal response’ to racism. By the end of the comments, the transformation of the argument is complete. 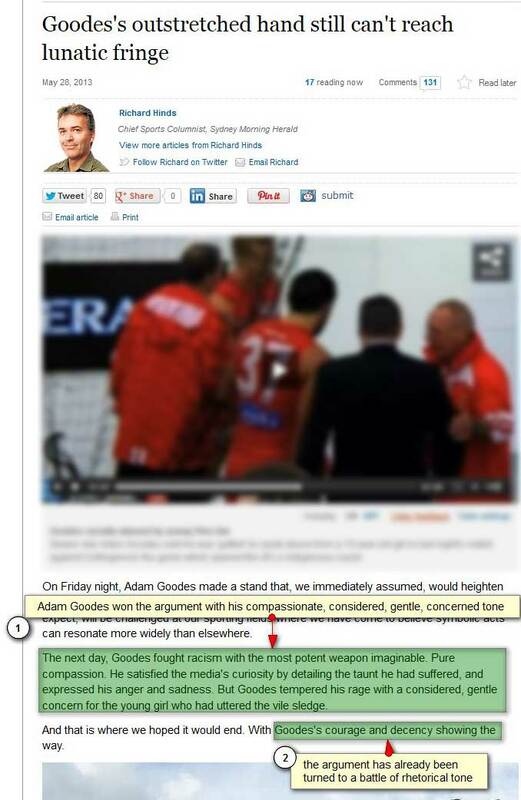 Full article: Richard Hinds, Goodes’ Outstretched Hand Still Can’t Reach Lunatic Fringe, 28 May, 2013. + comments. Disclaimer: all copyrighted material dealt with fairly, for the purposes of criticism, as described under The Copyright Act, Fair Dealing (G079v06). If you have an objection, please let me know at jana dot perkovic at gmail dot com, I am more than happy to discuss matters amicably. And for heaven’s sake, publish nothing before you are thirty.